It is no secret. I love chicken. Like, LOVE chicken. My mom makes the best fried chicken I have ever eaten, and I love that too. I, however, can't seem to get it right. I have tried everything, make it to the letter like she did, but I tell you, some things just aren't meant to be made by anyone but mom. Agree? Anyway I was really hungry for fried chicken and potatoes and gravy. So, I decided to combine it, kind of. There is no amazing twist to this very simple, common recipe of mine. It is just how I do it, and how I wanted it this night. You know how that goes when you are hungry for something and you don't get it? It is like someone has awakened a beast inside of you that can't be tamed until you get it. I KNOW you have been there!! Once said food has been ingested, the world is perfect again. Yea, it was one of those kinds of days. This dish takes some help from the store, but you know, I won't apologize for that anymore. I am done feeling less than human if I open a can to include in a recipe sometimes. So don't even go there with me. Don't. Do. It. K? HAHA! Let me give you the recipe, you can do with it, what you want! I served it of course with mashed potatoes and green beans. YUMMO, my fav combo, chicken and green beans. OH, I love it! Ok, look in the PS below to find a less sodium alternative. I can't guarantee your outcome but it is what I would do if I didn't use the cream soups. Preheat oven to 350 degrees. Now, find your best frying skillet, add in about an inch of oil. You may need to add more later so keep it handy. Now take your chicken breasts, dip them in your flour, then the egg and then cover in breadcrumbs. Place the chicken in the skillet. Fry on medium heat for about 3-4 minutes per side. Make sure to only do a couple of pieces at a time. You are just working on a great crust, not worrying about cooking the chicken the whole way through at this point. When it is done, remove to a rack on a cookie sheet to drain. Do this with all chicken breasts. Now, in a 9x13 pan, arrange all chicken breasts. It is OK if they are overlapping here and there. In a large bowl mix soup, pepper and chicken stock. You will need at least 1 cup of stock but up to 2, depending on the thickness of the gravy you prefer. I used 1 1/2 cups. Use a whisk and combine completely. Pour over all the chicken, making sure they are all covered in gravy! Bake for 30-40 minutes COVERED with foil. Remove and serve! 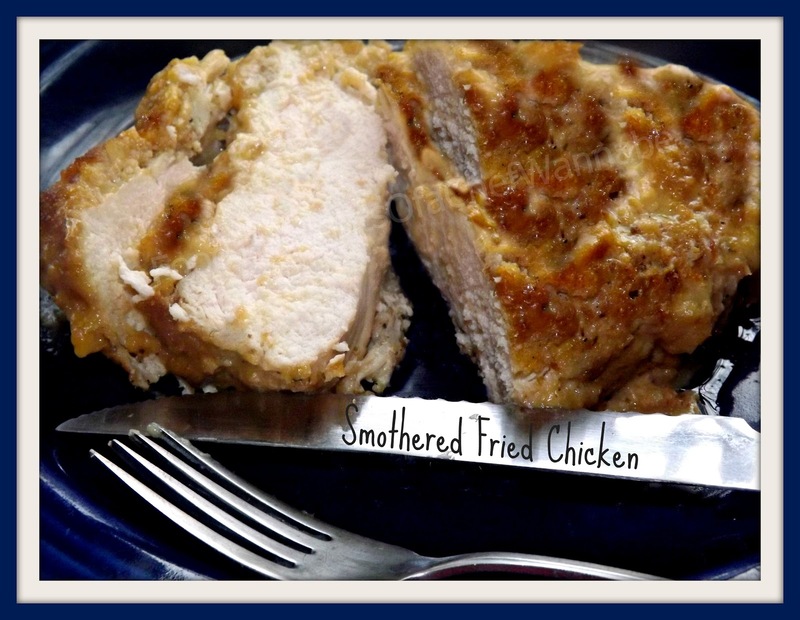 I hope you enjoy this simple, but so satisfying meal that takes some help from the store! I know you busy parents will appreciate it and served with mashed potatoes, it is heaven!! Leftovers of this are even BETTER than the first time you ate it! Thanks for sharing your recipe. I don't see where we are frying after we "place the chicken in the skillet". What level of heat should we be applying to the oil? Is this a big grease splatter moment?